John "Johnny Doc" Dougherty (left) and Roger Stone were both the subjects of federal indictments. Remember what you were taught about the passive voice? It’s bad. Don’t use it. If you have to use it, you should feel really sorry about it, hang your head low, and say a few Hail Marys first. 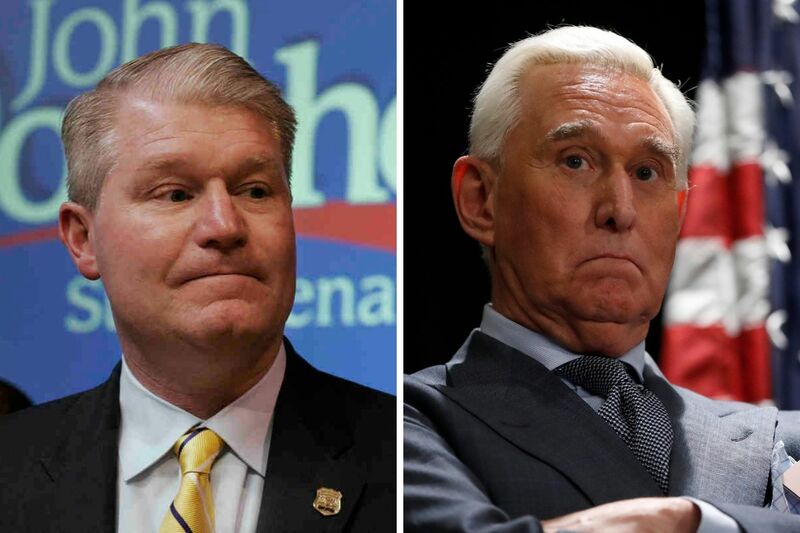 A close read of the Johnny Doc and Roger Stone indictments reveals that the U.S. District Courts of Eastern Pennsylvania and D.C., respectively, are wielding that passive voice judiciously. The 116 counts against Local 98 leader John Dougherty and friends are a tour de force of active, past-tense verbs, meant to directly implicate those named in the indictment: They say Johnny Doc “controlled,” “used,” “conspired,” “stole,” “misrepresented,” “directed” — all in the opening paragraphs. The court wants no ambiguity regarding who, exactly, performed these actions. The language is dramatic and damning. This is weird. And not an accident. Legal scholars will offer myriad explanations for why Mueller wouldn’t want to name who directed the senior Trump campaign official. It would have to be someone really senior, perhaps the candidate himself, and maybe the special counsel doesn’t want to tip his hand about what, if anything, he’s serving at the end of the investigation. But this is one case where the ambiguity that the passive voice offers is likely a weapon, not a weakness. A) Members of the U.S. District Court of Eastern Pennsylvania much better remember what their English teachers taught them, and showed it in the papers filed last week. Score one for Pennsylvania schools. B) Robert Mueller knows his grammar, but he doesn’t know which very senior Trump campaign official gave orders to another already senior campaign official. Mueller is using passive voice to say everything he knows, nothing more. C) Mueller is saving his active voice for when there will be zero ambiguity about whom he’s implicating. At that point, there won’t be enough Hail Marys in the world. The Angry Grammarian looks at how language, grammar, and punctuation shape our world, and appears biweekly. That’s every other week, not twice a week, friends. Send comments, questions, and be-verbs to jeff@theangrygrammarian.com.